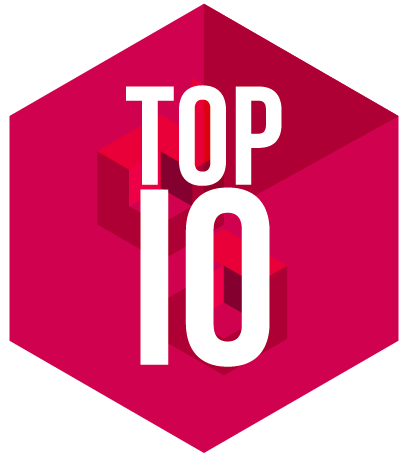 We are pleased to announce our Top 10 economy classes for 2013. We have scoured the world for airlines that have really shown us something truly special. Whilst many airlines didn’t make the list, we’d like to state that generally over the past 12 months, we have seen airlines around the world innovate and renovate their economy products to offer a point of difference and make them better than their competitors and the competition was close, meaning many excellent carriers just missed a place. The general outcome of that is a better experience for all travellers, and as new technologies emerge, we know the next 12 months means all could change. As rated by our judging panel, here are the 10 that really stood out from the rest, rated for giving the passenger the best possible experience, both from service and hard product in the air in an economy class. Porter is an airline that knows how to deliver. A boutique short-haul airline that lives it’s tagline ‘Flying Refined’. The airline offers stylish cream leather seats, free food and drink including tipples from local micro breweries and free lounge access for all their passengers. The airline, branded by Winkreative, is an airline that manages to provide business class efficiency and timetables, with a modern lounge style environment that wouldn’t feel out of place from a uber-trendy design agency in downtown Toronto. 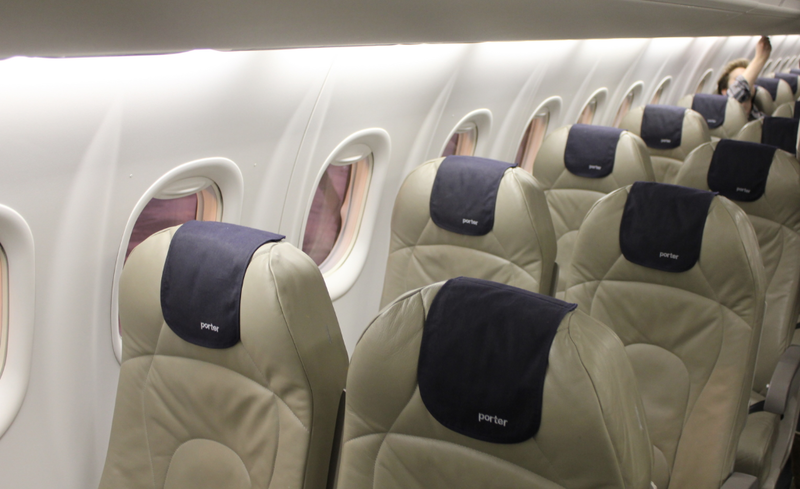 Porter, which has slowly grown over the past few years, has now announced it wants to move into jet aircraft, and once they have approval from the relevant governmental bodies, we can expect to see the carrier expand a little further afield. What we like is the all encompassing brand, everything sits as one, and the service on such a small cabin, feels more like a private jet than a commercial carrier, and whilst we still don’t like the noise of a prop aircraft, the 34 inch leg room more than makes up in comfort for something like that. We just want a bit more inflight entertainment if their flights get a little longer. AVOD Just an excellent magazine, originally designed by Tyler Brule. Best Bits The Toronto terminal is like a business class lounge but available for all passengers. Worst Bits Whilst we love the airline, the prop planes are a little noisy, still, there are jet aircraft being talked about too. Aloha! to one of our favourite Pacific gems. Since the launch of the Hawaiian A330, we can’t get enough of this carrier, as it beats the proverbial off other American carriers flying the US West Coast to Hawaii routes. Whilst we have done our fair share of ‘Hawaii fun flights’ with legacy carriers such as United and Delta, Hawaiian have brought a bit of pacific sophistication to Mainland US. The new airbus planes offer AVOD at every seat (for a small charge) and the best bits are the complimentary drinks and food that make the carrier feel like not everything is about making money. The Island’s traditions are a big deal for Hawaiian, and Hibiscus and Leis can be seen on the flight attendants, Koa-nut garlands on the men too. Now that Hawaiian are expanding across the pacific to Korea, China and Japan, there is even more reason to fly with this wonderful airline. From check-in to arrival, it’s a bit of Pacific spirit we can’t get enough of. 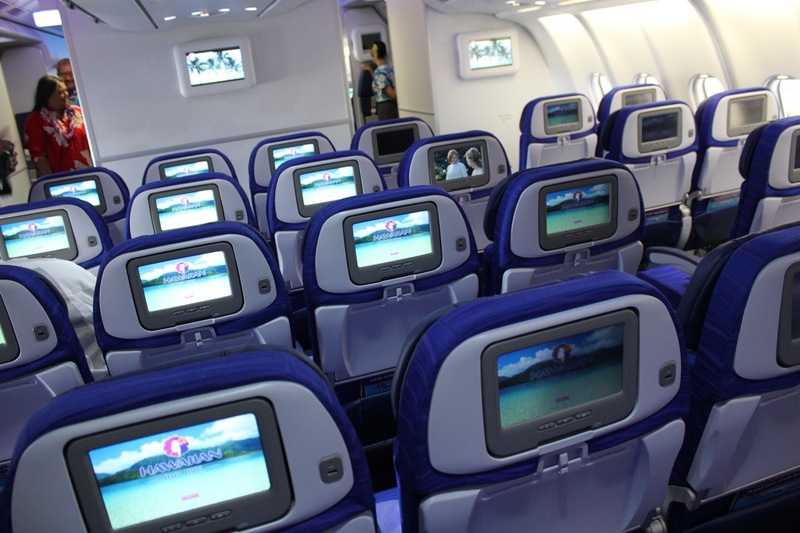 AVOD Available on A330’s, overhead screens on 767s and Hana Hou magazine on 717s. Best Bits A330’s, great to fly on and personal TV’s make for an enjoyable trip. 717’s give great entertainment out of the window, so book a window seat. Worst Bits 767’s, when on one, you want to be on an A330. Starflyer, who featured in our Top 10 liveries last month certainly know how to make low cost look and feel cool. With personal LCD monitors for every seat, there are video channels, music, maps and more for every passenger, whatsmore, the entertainment is available for use from landing gear up to landing gear down. Whilst you can charge your own mobile phone or laptop, they also have rechargeable mobile phone batteries onboard, incase you are one angry birds moment away from a dead device. Let’s not forget complimentary drinks as another tick for the airline, and virtually unheard of for a low cost carrier. Another nice touch is that centre seats in the 3 x 3 across cabin, (notoriously the last ones to go) can be converted into cocktail tables, giving you even more space for your personal belongings. In short this airline succeeds in making a low cost trip, a chic affair, and like Virgin America, proves low cost can actually be cool. AVOD Available on every flight. Best Bits Apart from the uber-cool black exterior and interior, all the extras for no extra cost. Worst Bits Only 9 destinations. boo. Virgin Atlantic have finally managed to get their product in line, after a fairly damaging difference between their economy product flying leisure routes from Gatwick and the business routes flying from Heathrow. Comments used to vary wildly dependant on which aircraft and route was flown. Whilst we are self confessed lovers of the Virgin brand, (and see the bigger picture) we think they do stand out as the most preferential carrier between themselves and rival BA, it’s great to see they have invested in a problem that was around for a few years and finally brought in line their cabin offering fleet wide. Actually, the Gatwick route now offers a much more advanced and reliable entertainment system than the once legacy Heathrow routes. It’s the small touches that we like, like ice-cream mid route and welcome cocktails that make this airline stand out. What we really like now is that you can watch the TV from gate to gate, allowing on average another hour’s worth of entertainment. The cabin service whilst not as refined as Asian carriers, is heart-felt and their new company slogan, flying in the face of ordinary certainly rings true. 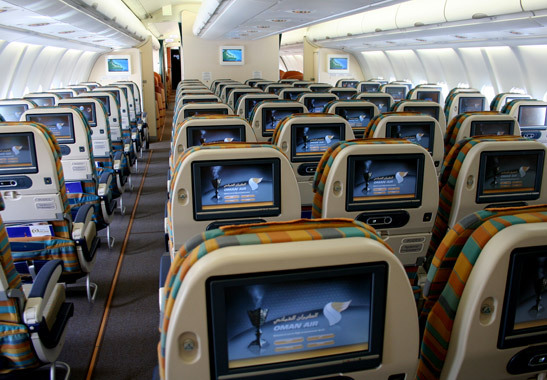 AVOD Available on every flight, the new JAM system includes touchscreen technology. Best Bits The entertainment usually has more movies and TV channels that you want to watch than you can watch in a return flight, and now can be watched gate-to-gate. Worst Bits A little more legroom would be nice, without having to pay for it. AVOD Available on every flight on touchscreens 10.6″ in size. Best Bits The 787 is an excellent new aircraft for the airline, definitely worth a trip. Worst Bits If you don’t like the colour maroon, you better bring an eye mask. Etihad Airways is really pushing the meaning of airline quality, and making other airlines watch their backs as their continued advancements help to make their ‘guests’ (rather than passengers) more welcome and cared for than almost any other international airline in the world. The cabin feels relaxing and the modern prints used on their soft furnishings help keep the cabin contemporary. Mixing the comfort of the cabin with technological wonders such as in seat power and 10.4″ touchscreen personal entertainment means that almost all of your desires are catered for. What Etihad really excel with is the quality of their catering. They cleverly manage to excel above and beyond their guests estimations, at a price which seems very reasonable. As they continue their expansion plan, quality isn’t dropping, but their network is increasing, meaning this carrier offers ‘one-stop’ luxury to all the major destinations in the world. Best Bits We love the interiors, but more importantly, the food is excellent. Worst Bits Seats are a little narrow for a long flight, but cabins are rarely full, giving a better chance to stretch out. This is an airline that treats economy passengers like business class passengers, in fact, many of its economy class travellers are travelling on business. This is the reason Singapore Airlines is still seen as the most prestigious airline in the world, facing off newer rivals such as Emirates, Qatar or Etihad. Even since it’s split from now Malaysian Airlines, the airline has forged itself as the pinnacle of quality. From it’s vast entertainment library, to it’s continuing investment into it’s hard product, this airline hasn’t rested on it’s laurels to be the best, and whilst not on the best of our list, this is purely down to the anti-competitive prices still attributed to flying with the carrier. Other airlines are now starting to offer an equal product, perhaps with a different finish to it, at a reduced price. We also feel that the airline, whilst continuing to polish and protect its unique product, hasn’t really invested many new products into their economy class (bar the inclusion of WiFi fleet wide), unlike Air New Zealand for example, and instead have invested more heavily into the front of the plane. 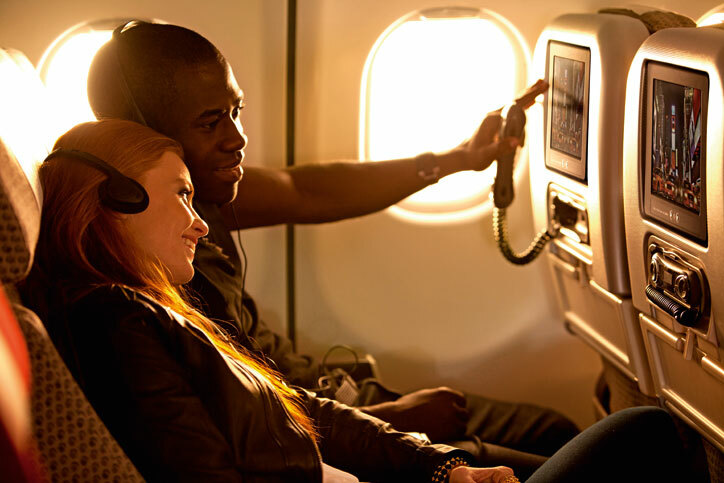 AVOD Available on every flight on screens 10.6″ in size, featuring over 1000 entertainment options. Best Bits The Singapore girl, trademarked for good reason. Service and attention is the reason to fly. Worst Bits Still one of the most expensive carriers to fly with, it often comes up weighing up price over quality when picking a flight. A secret airline in the midst, our airline that ‘everyone-has-heard-of-but-still-not-flown-yet’ is more a large luxury jet than passenger airline, with the excellence in service found in Middle Eastern carriers. Oman Air has managed to secure a list of awards longer than it’s arm and yet, still most people will pick big brothers Emirates or Qatar over this genuinely excellent airline. 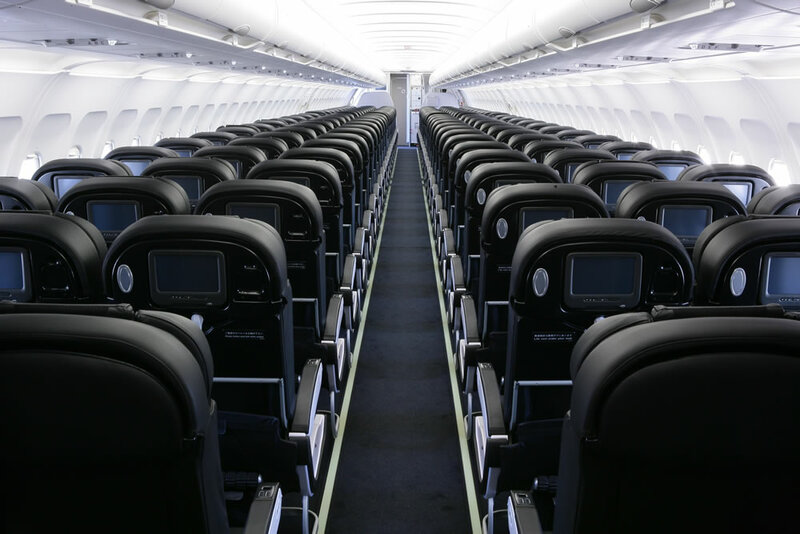 With a huge amount of legroom, akin to the legroom found in American carriers ‘Economy Plus’ in every seat, this airline provides more space per passenger than almost every other airline at no extra cost. The airline itself has an expanding network, and whilst not as encompassing as other middle eastern carriers, it still can carry passengers from most major cities in the West to most major cities in the East. Regularly excelling in SkyTrax’s reports, the airline is showing consistently that the experience is well above passengers expectations. If you haven’t travelled with them yet, this is a must. We hope to bring you a business class trip report with them very soon. AVOD Available on every mid/long haul flight on screens 10.6″ in size, overhead tvs on 737s. Best Bits Relaxed, open cabins, excellent service and modern up-to-date AVOD on generally never full cabins mean for extra space and a higher level of attention. Worst Bits Luggage limit could be a little bit more for economy travellers, 3 kgs less than most international carriers. If only long haul could be like this, here at Thedesignair we applaud this upstart airline in the states for creating some truly industry-changing products, from ordering food, drink or even clothing from your seat, to live TV and videos on demand. Last year, you could even register to vote in the elections from 35,000ft. And now, you can even buy strangers a drink somewhere else on the plane without even having to strike up an awkward conversation! 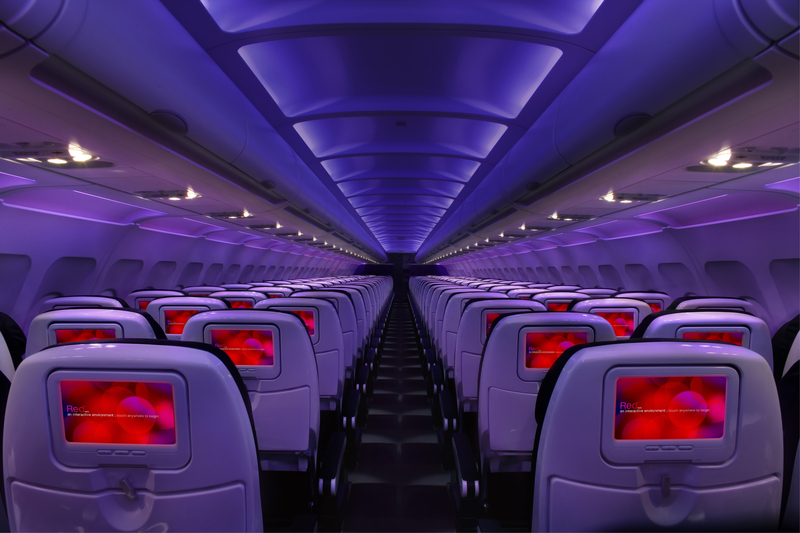 The economy seats in Virgin America, in black leather and white backs are super space age, mixed with mood lighting and bright red screens are more ‘Star Trek’ when you enter than passenger plane. We like the uniforms too, although as previously mentioned, the staff can be a little hard to spot in the airport (perhaps a little too casual), when you need their help checking in! With the option to purchase lounge access or ‘Main Cabin Select’, and even wi-fi the airline offers a wealth of bolt-ons to make your flight even more enjoyable. What’s more, with news of them commencing flights to Hawaii in 2014, we are super excited to see they still have big plans. AVOD The best in the business, fully integrated, heaps of movies, and TV shows, available to purchase (some for free), along with enough gadgets and gizmos to virtually do everything, bar clean the dishes at home. No surprise here that Air New Zealand should be winning the category here. Aviation innovators and the creators of the SkyCouch have tried to work out exactly what economy passengers want from their flight. Apart from some of the friendliest crews in the skies, the inflight entertainment is excellent, with a wealth of international and local films and TV programmes. On the 777 they launched their sky couches which are the closest thing to business class at a fraction of the cost. Allowing you and someone else to share a row of economy seats, with a fold out mattress that comes from under the seats to form a 3 foot wide bed. Perfect for ‘topping and tailing’. Food is great, partnered by amazing NZ wines and is fairly consistant in quality. The 777-300’s all have laptop power to keep your own entertainment working and on the new 777-300 Aircraft, you can order food and drink from your seat IFE screen without having to reach to the dizzy heights in the ceiling to call for cabin crew. Best Bits Great service, still a ‘cool’ contemporary airline to fly with, great food and excellent entertainment, mixed with brilliant innovations such as the skycouch. Worst Bits The seats are a little narrow on the 777 aircraft and seat pitch isn’t as good as other carriers. Interesting. But Qatar baggage allowance is 2 x 23kg only if you’re flying to/from the Americas. Elsewhere it’s 23kg. And by the way when you say ‘Seat Pitch 31-34″ (dependant on aircraft and seat)’ I don’t think that you mean one of your children is on the aircraft or seat. Try ‘dependent’. This article is a load of crap. You’ve awarded the top spot to Air NZ, despite the fact that their 777s offer a criminally tight 3-4-3 configuration. For an airline to make this list, it should have: unlimited free alcohol, free hot meals, free in seat AVOD and free checked luggage. Where are Virgin Australia and Qantas on this list? Both have far superior economy products to all airlines except perhaps Qatar and Singapore. Etihad has 3-4-3 on a 777 …. not cool, no matter how good the food! Oman Air no3! Someone must of slipped someone an envelope full of readies as flying with them last month was one of the worst flights I have ever encountered…….. 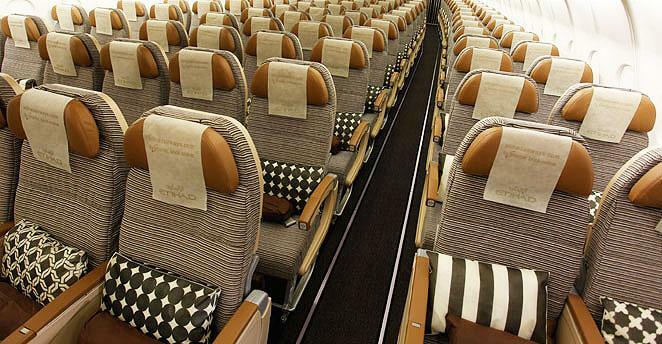 The NZ SkyCouch has had a lot of complaints such as… Can’t be used if seat in front is reclined. Google it and see. You don’t mention Emirates but with their 3-4-3 777 config it’s like flying in a straighjacket – by far the worst. With all respect, but something needs to be corrected. The best bit of Qatar is not the 787, it’s the worst bit. It’s the only seat in my whole life that felt cramped (however, I fear it won’t be the last). 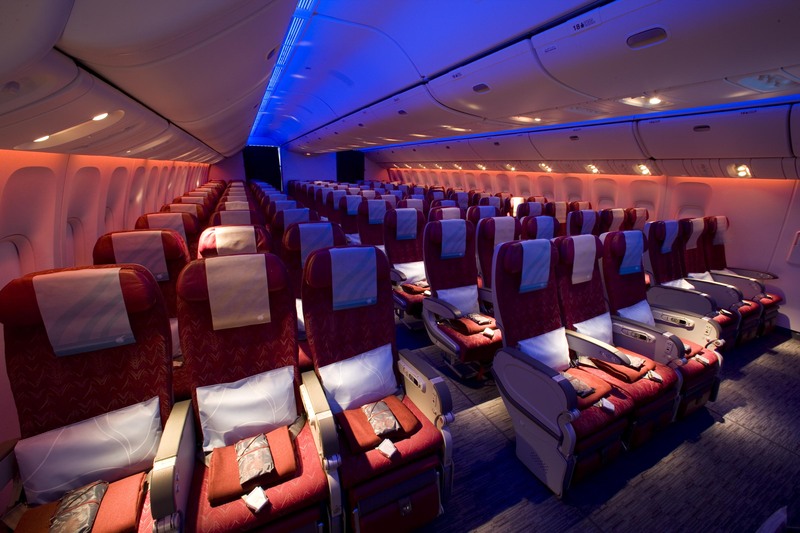 Their 777’s are among the best in economy, but what they did with the 787 is really not good. However, it seems only JAL flies the 787 properly in economy, all the others go for the terrible 3-3-3 configuration instead of the 2-4-2 it was designed for (yes, a difference of 1 seat in a row). You can really feel it, trust me. No 787 for me, unless it’s JAL. I agree with Clement the normal experience with Qatar is great but not the 787 as it is the most uncomfortable plane I have ever travelled in economy never again , I now check the type of aircraft before booking.